Randall Fisher is a licensed clinical social worker who has provided counseling and psythotherapy to individuals and families for over thirty-five years. Randy has written a parenting handbook that helps children who have witnessed domestic violence and co-produced an early intervention, parenting video series. He has also developed a clinically based video intervention program and provides organizational consultanting services. Randy is a past recipient of the Berkshire County, MA, NASW award for “Contributions to the Professional.” Randy maintains a private practice and is the Director of Behavioral Health for the Hilltown Community Health Centers in Huntington, Ma. Dr. Anthony Siracusa is a licensed psychologist who has been involved in the study and treatment of adults, children and families with psychological, health and interpersonal issues for over 30 years. He attended Long Island University as an undergraduate, and Indiana University for his graduate studies. He has authored several papers and book chapters on a range of issues in clinical, health, and educational psychology. He has presented his work at both national and international conferences, and has conducted many workshops on the delivery of clinical care. As a clinical consultant to social services agencies, educational institutions and medical facilities, he provides other professionals with problem solving skills on dealing with difficult cases. Tony is the CEO for Siracusa Associates Behavioral Health with offices in Williamstown, MA and at the Massachusetts Museum of Contemporary Art (Mass MoCA). http://www.siracusatherapy.com is his website. The decision to change your life and start therapy has been made. But what exactly is “therapy?” How is it different from counseling? How does it work? And, more importantly, how can I make it work for me? Your Psychotherapy and Counseling Companion has been developed by experienced psychotherapists with the expressed purpose of making your journey of change more focused and efficient. It is your bridge from the work done “in the office” to your real and outside life. In concise, easy to understand language, it provides an overview of what therapy is, how it works and how to stay on track. It will guide you from the first session to the last and help you identify the issues most important to you. It explains the key elements of different talk therapies, interventions and homework. It gives a useful, brief overview of medications and when and why they are used. And finally when you have completed your therapy work you have a personal, written history to serve as a future reference. 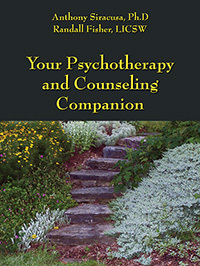 Your Psychotherapy and Counseling Companion is truly your guide, teacher and support as you embark on the exciting process of change and taking charge of your life.